I use flows to understand movement through the experience of a process or product. Depending on the project, I create flows (user, process, task etc.) as a starting point in the design process to help define wireframes and prototypes. Flows are also valuable in addressing how external systems will be integrated into a process or how a user will move through a cross-channel experience. Creating flows allows me, and the teams that I work with, to understand what is happening to a user as they encounter different elements within an experience and focus on what is important. 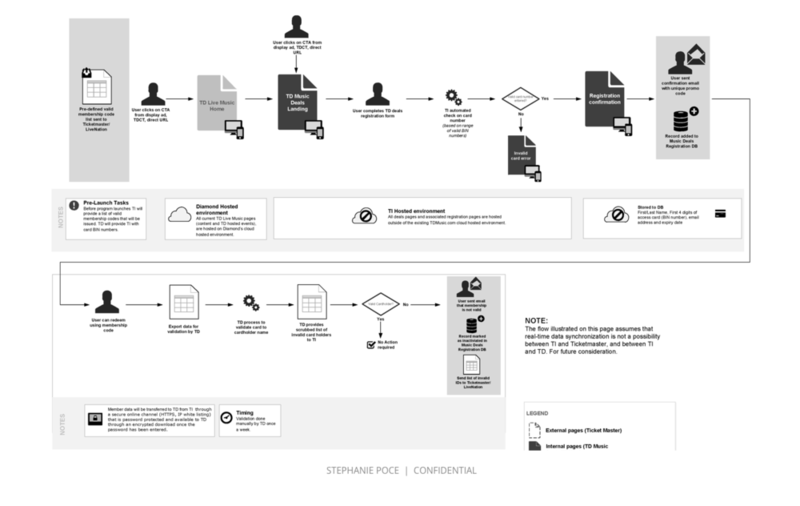 This registration process flow (excerpted from a larger set of flows created for this project) illustrates the process of registering for TD Music Access. This website allowed TD customers to access discounted concert tickets and merchandise. The flow depicts how information is stored and transferred within the system along with back-end processes and requirements. This screen flow follows the sequence of screens available to a user through the Tim Card feature on the Tim Hortons Mobile App. This flow was used to connect the wireframes to a user's possible movements through the app and ensure that all of the user scenarios and activities related to a user's Tim Card had been considered. This decision flow is an excerpt from a set of flows created for a interactive tool that helped people make a decision about loan options. This flow explored the various options for student loans by leading the user through a series of questions and decisions to reach an outcome. A prototype was created using these flows to test each scenario and inform both content and design.